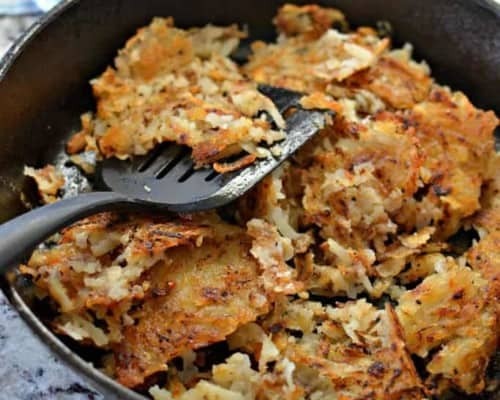 Crispy Homemade Hash Browns are absolutely delicious and well worth the effort. They make for the perfect Sunday breakfast or brunch. Add the potatoes (unpeeled) to a large pot of water. Bring to a boil and cook for 10 minutes. Plunge the potatoes into cold ice water to stop the cooking process. Let the potatoes fully cool, dry and peel. Shred the potatoes with a box grater or a food processor with a shredding attachment. Soak the shredded potatoes in cold water for 30 minutes. Stir several times to release the starch. Drain the water. Soak again in cold water for 30 minutes; stirring several times to release the starch. Drain the potatoes in a colander. Scoop the drained potatoes into a clean towel or cheesecloth and squeeze out as much excess water as possible. Add 2 tablespoons of bacon fat or canola oil to a nonstick or well seasoned skillet over medium high heat. Swirl the fat to coat the pan. Add the shredded potatoes in an even layer and season with salt, fresh ground black, onion powder, garlic powder, paprika and ground cayenne pepper. Press the potatoes down in the pan and cook until golden brown: 10-15 minutes. Cut into sections, flip and brown the other side. Serve promptly.